Wedding proposals are the things that many girls grow up dreaming about and most young men usually dread. They are supposed to be perfectly romantic and at the same time unforgettable. Some among us are thoughtful and creative enough to make great plans, but some of us give the word unforgettable a whole new meaning. Let’s set the scene. A young couple attends a sporting event and some time during the evening, the young man disappears. Maybe his excuse is that he was going to get some nachos. What he is really doing is getting into costume to surprise his girlfriend at some point. 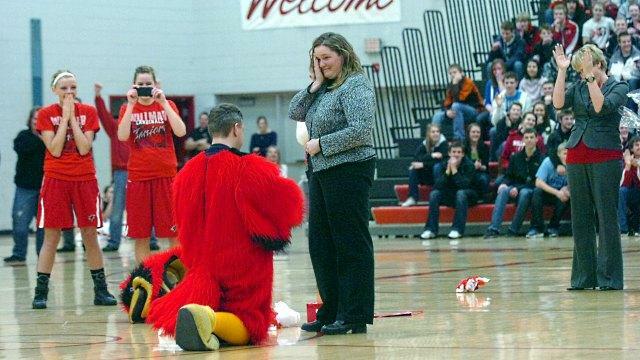 Then in front of thousands on people and maybe even on television, he finds a way for her to interact with the mascot and then surprises her by holding up a sign or even worse popping out of the suit to propose. Conclusion: The result is usually one very embarrassed girlfriend and one soon-to-be single guy. The recipe for this disaster is pretty easy to follow. First, find and purchase an expensive engagement ring. Second, buy some helium balloons. Third, attach the ring to one or more of those balloons. Sounds romantic, right? Wrong. This can play out badly in any number of ways. The balloons can be caught by a gust of wind before even reaching the proposal itself or either person might get so excited that he or she just forgets to hold on to the balloons. Conclusion: Can anyone say “up, up and away”? Birds fly, planes fly. Rings should not fly. Pick a holiday, any holiday. Get yourself invited over to spend it with your girlfriend’s family. They seem nice enough, right? So, you decide (without any advance scouting of her possible reaction) that you’re going to propose to your girlfriend in front of her entire family. If she says yes, the worst you’ve done is made what should be a personal moment public. But, if she wants to say no, you have now embarrassed her in front of her entire family and after she runs from the room, there will definitely be an awkward silence. Conclusion: Family events can be stressful enough without adding a marriage proposal to it. The guy has made his plans. He’s got his friends in on the night to help him keep things casual and serve as backup support. You know – just in case. He buys a beautiful ring and is sure of his long-time girlfriend’s response. They plan a night out at a great restaurant. He’s nervous, but things are going along nicely. Then, just as he starts his warm-up, another guy gets up and gets the attention of everyone in the room. He then drops to one knee and proposes to his own girlfriend. And with that the first guy’s plans have been derailed. There’s no way he can propose now without looking like a copycat. Conclusion: If you choose a location that might lend itself to proposals, don’t wait until the end of the evening to make your move. The young man goes shopping for food. He returns home to prepare a delicious meal complete with music and candlelight. He has asked his girlfriend over for dinner and plans to propose. The only detail he has forgotten is to let his girlfriend know how she should dress up for the meal. This may not be a problem if the girl in question always dresses up for dinner. But if she happens to be someone who likes to exercise, she may just show up in sweaty gym clothes. Not exactly what the young man had in mind. Conclusion: Don’t forget the tiniest of details. They’re important, especially if you were counting on a nice photograph.